There are two general types/kinds of restorations that can be fitted onto implants. Cement retained or screw retained restorations. Here is an example of how Cement Retained Dental Implant Crowns works and what they look like. The Cement Retained Dental Implant Crowns are bonded onto the dental implants usually by means of a temporary cement. This is important since it ensures that the crowns are secured onto the implants by means of a glue which can be 'broken' if needed in order to access the dental implants. The advantage of this is that at any time the cement retained crowns can be easily removed. Cement Retained Dental Implant Crowns do not have an access hole to the abutment screw of the implant. 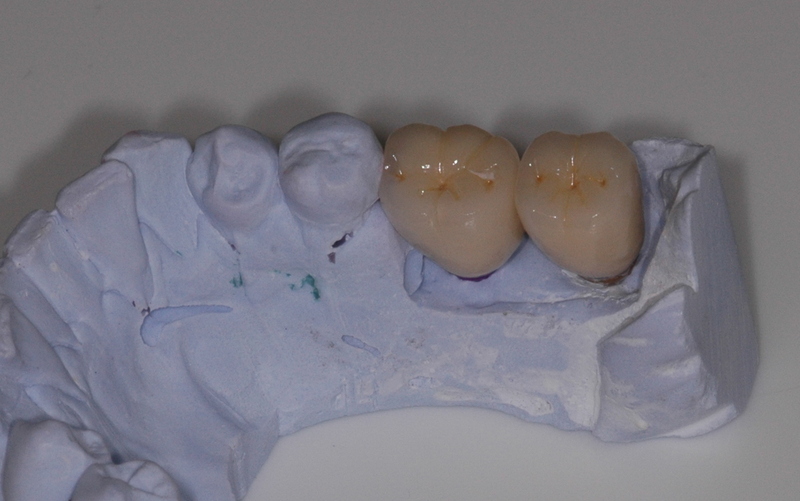 In this case it allows for a more aesthetic crown to be achieved without the access hole. Even though the access hole is very small it is still very slightly evident with tooth colored dental cement. 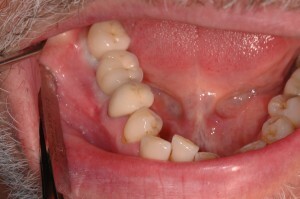 Patients sometimes request cement retained crowns to avoid this access hole. The disadvantage of cement retained crowns is that they can be difficult to remove even with temporary cement. Another disadvantage of cement retained crowns is that excess cement may accumulate under the dental implant crown margins. 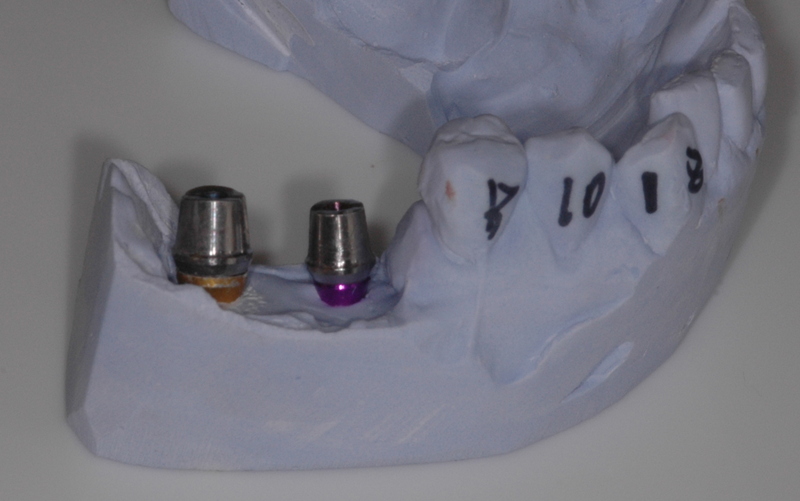 Two standard titanium abutments are positioned on the implants. The height and width of the abutments is determined by the amount of space available between the adjacent and opposing teeth. The standard titanium abutments are tightened onto the implants by means of a manufacturers recommended torque wrench. 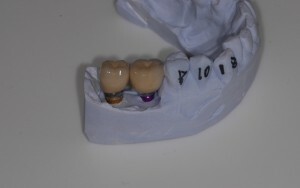 The cement retained crowns are positioned on the dental implants. The color and fit are verified and if the implant crowns are correct and the patient is pleased they are cemented in the mouth with a temporary cement. Temporary cement is used as a long term cement however it is possible to remove the crown in future if any problems should arise on the implants. Brighton implant clinic provide a FREE initial assessment for all new patients. To book your appointment Contact Brighton Implant Clinic or Call us on 0800 111 6623.